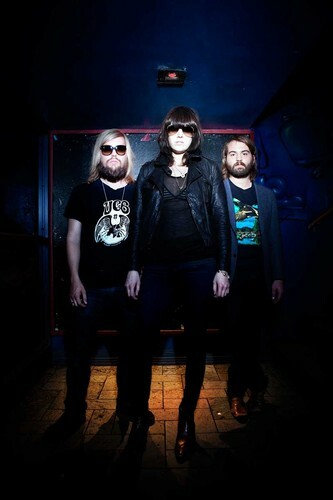 Band of Skulls are an English alternative rock band from Southampton, consisting of Russell Marsden (guitar, vocals), Emma Richardson (bass, vocals), and Matt Hayward (drums). The group formed after meeting in college, although Russell and Matt have been friends since school. nitially, the group played at night clubs in the Greater London area and recorded some demos under the name of Fleeing New York before changing their name to Band of Skulls in November 2008. The band's original demos were recorded in their father's shed-studio. Band of Skulls debut album Baby Darling Doll Face Honey, distributed by Shangri-La Music, was released exclusively on the iTunes Store on 6 March 2009, followed by a general release on 20 March. The track "I Know What I Am" was chosen as iTunes' free Single of the Week to coincide with the digital release. The song was also featured in the soundtrack for TV series Friday Night Lights, Volume 2, which was released on 4 May 2010. Another track that was not actually on the album,"Friends", was included on The Twilight Saga: New Moon soundtrack in November 2009. On 26 October 2010, Band of Skulls released a live album called Live on KCRW's Morning Becomes Eclectic. On 5 October 2011, the band released "The Devil Takes Care of His Own"—the first single to be taken from the new album—with an accompanying music video. The second studio album Sweet Sour was recorded at Rockfield Studios in Wales. It is produced by Ian Davenport (Supergrass, Badly Drawn Boy), who also produced their debut album, and was released on February 21, 2012 in the US, and February 20, 2012 in the UK and Europe. On 12 April 2012, Channel 4 will broadcast a short documentary starring the band. They discuss the formation of Band Of Skulls through to going from working the bars of their hometown to playing music in front of expansive crowds of adoring fans across the globe. It is a rare and intimate insight into the world of Band Of Skulls, focusing of their success and achievements over the years.